Celebrate awesomeness and decorate everything you own with the Vat19.com indoor/outdoor die-cut sticker. Each of these curiously awesome stickers is approximately 4.5" x 2.2" and features UV coating to protect it from the elements as well as resist scratches. This video was made prior to updating our logo. The sticker now reflects our current logo design. 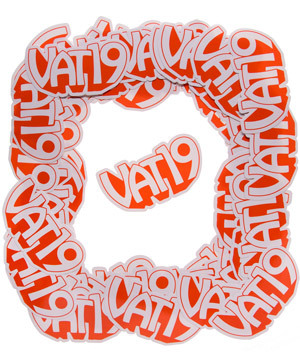 Slapping a die-cut Vat19.com sticker on any object is like giving it an injection of pure awesome. 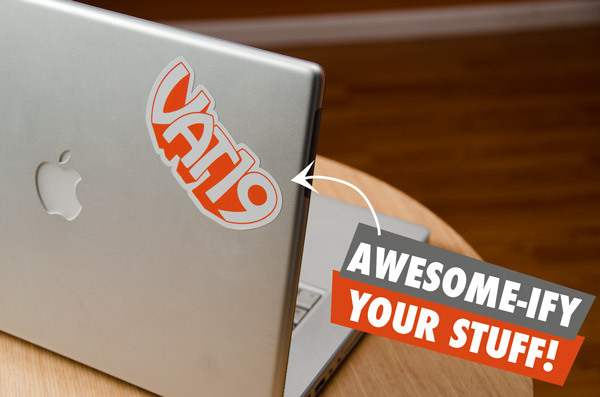 Scratch-resistant Vat19 stickers are great for laptops, notebooks, lockers, file cabinets, and more. The vinyl UV coating not only protects your sticker from the elements and scratches, but it also makes the colors more vibrant. 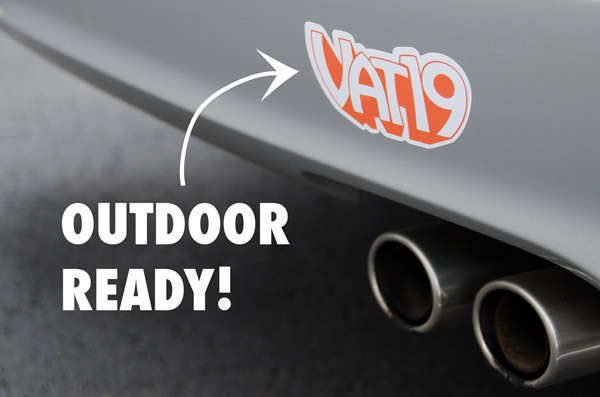 Avow your love of Vat19 in public places with our indoor/outdoor die-cut Vat19 sticker. Give one to a friend. It only costs a penny! Here's how this works: Buy 1 sticker and it costs $0.99. Buy more than 1 sticker and each sticker costs $0.50. So, if you buy 2 stickers, the cost is $1.00. Three stickers = $1.50. Four stickers = $2.00. Good deal, right? Yeah! 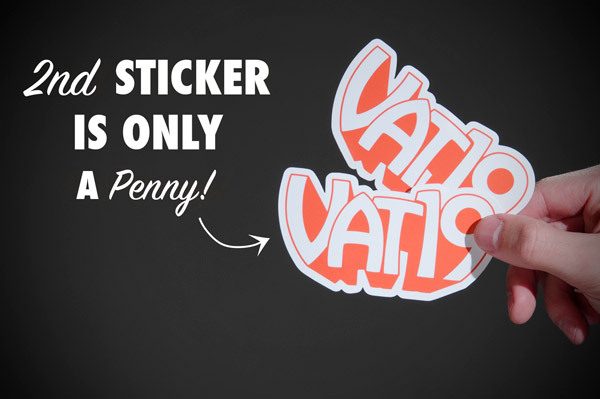 With our discount structure on stickers, the first sticker costs $0.99 and a second is only a penny more. Question: Wait... how much are the stickers? Answer: One sticker is $0.99. Two (or more stickers) decreases the cost per sticker to $0.50. Therefore, if you purchase two stickers, you're only paying $1.00. So, the second sticker only costs you a penny more than a single sticker. It's pretty much a no-brainer to order two stickers. Give one to a friend and spread the word! Question: Why do I have to pay for stickers that promote your website? Answer: While we'd love to give away our stickers for free, we can't afford to do so. Die-cut stickers for indoor and outdoor use are actually pretty expensive. That being said, is this really that much different than purchasing a t-shirt of your favorite restaurant or band? Question: How can I get them for free? Answer: If you send us fan mail, we'll typically toss one in with our reply. Also, we randomly give away free stickers in outgoing orders. However, due to the number of orders we process, the odds aren't too great that you'll get one.